A graphic depiction of airline market shares from 1974 to the AA/US merger now. Click for a full size detailed image. With the pending merger of American Airlines and US Airways, the two largest US carriers (the merged US/AA & UA) will control almost exactly 50% of the total market, and the three largest (AA, UA and DL) will have just a sliver less than 73%. This is uncompetitive in the extreme. Only a couple of years ago, it required five airlines to amass the same 75% share, and at the height of competition (1985) there were ten airlines fighting over their 75% share. In 1985, the largest five airlines controlled about half the market, but now the largest five airlines (AA UA DL, Southwest and Jetblue) control 9/10th of the market. A market can be defined as being competitive, or being controlled by an oligopoly, or by a monopoly, depending on the market share of the four largest players. If the four players control less than 50%, then the smaller the percentage they control, the more competitive the market. Depending on other factors, the closer to 50% they control, the more likely the market has become uncompetitive and instead is an oligopoly. Assuming the AA/US merger proceeds with no substantial changes, then for the first time ever, the four largest airlines control 85% of the total market in the US, making it now presumptively a monopoly. At the most competitive time (1985) the four largest airlines controlled half that (43%), and prior to now, they have never had more than a 65% share. Here’s an interesting series of pie charts showing, in five year intervals, the US market share (as measured by annual revenue passenger miles flown) by all airlines with a 0.5% market share or more. The data series we are using starts in 1974. We chose to use 1975 data as the start of our chronology simply so our five yearly snapshots would be at conventional year points. 1975 was in the final part of airline deregulation, which ended in 1979, so it provides an interesting baseline from which to compare all subsequent years. Deregulation has just started, and already you’ll note a massive increase in the number of airlines appearing in the pie chart (we only include airlines with 0.5% market shares or more. But the ten major carriers, while having lost appreciable market share, still remain clearly dominant and their respective market shares, with respect to each other, are little changed. At least as recorded by our five year time slices, this chart captures the golden age of competition. It also shows the disappearance of one of the majors (Braniff) which grew too quickly and then imploded on itself, and the appearance of a new airline, almost overnight and out of nowhere (People Express) as the ninth largest carrier. Clearly new startup airlines were tapping into a rich vein of public support. So much for People Express. Like a super nova, it flared suddenly into prominence and just as quickly disappeared again (merged into Continental). And another of the ten majors (Western) has also vanished, merged into Delta. Goodbye, Pan Am (Delta took some of what remained of Pan Am) and goodbye also Eastern (which largely closed down with no merging). The ten major airlines prior to deregulation are now down to only six, and the largest of these are now starting to get significant individual market shares. A trend towards consolidation is starting to become apparent. Changes in market share among the major carriers have seen a slight lessening of market share held by the two largest carriers. Some people view 9/11/2001 as a watershed moment in US airline history. Sure, it was a significant event, but in terms of economic impact, it affected all airlines equally and didn’t upset any of the underlying market dynamics. But the five years from 2000 to 2005 did see the disappearance of another of the historic majors (TWA, merged into AA) leaving now just five of the ten we started with prior to deregulation. Another goodbye – this time to Northwest (merged into Delta) and the competitive situation is similar to 1995 in terms of shares held by 3 or 4 or 5 or 6 different carriers. Northwest’s demise reduces the number of surviving dinosaur carriers down to four. What a different in little more than two years! Continental has been merged into United, and AA and US are to merge as well. This leaves only three of the original ten airlines we’ve been tracking, and whereas the 2010 market shares looked not dissimilar from past years, we now see a totally different distribution of market shares and an extraordinary dominance by just three major carriers. Here are two more ways of looking at the data in the preceding nine pie charts. The first shows the growth in market share controlled by the largest 1/2/3/4/5 airlines, and the second shows the decline in airlines of measurable size. Both these charts point to a marketplace that is increasingly and effectively controlled by the dominant players, and the increased competition initially created by deregulation has long since become merely a fading memory of the distant past. A Contrarian View – Maybe the Majors Are Getting Weaker? Some people have pointed out that in 1974, the ten major airlines controlled 92% of the market, whereas now, the three remaining descendants of the major airlines control ‘only’ 73% of the market. They point to this and say that competition is strengthening, rather than weakening. We offer this viewpoint up in the interests of a complete review/analysis, but do not support it. To suggest that a reduction in market share from 92% to 73% is more important than a reduction in participants from ten to three is, we suggest, lopsided and simplistic, for three reasons. First, we all know that at times in the past, there have been glimmers of competition between the major carriers. While they have acted in large part as a group, with extraordinarily uniform approaches to pricing, terms and conditions, and every other element associated with buying a ticket and flying somewhere, they have more or less ‘kept each other honest’ – if any airline started to charge ‘too much’ on a popular route, other airlines would move in (whether to share in the over-priced profit, or to steal market share at ‘normal’ fare levels) and fares would return to normal again. But now, with only three airlines, the dynamic is greatly changed and the ‘invisible hand of the market’ encourages the airlines to – officially or unofficially – work in a more coordinated fashion. Second, it seems inappropriate to exclude the newer carriers from this analysis and focus only on the three largest carriers. While it is true that the remnants of the big ten carriers in 1975 have lost market share, there is very little difference in terms of fares and policies between the three legacy/dinosaur carriers and the competitors that have appeared. Southwest is becoming more similar to the dinosaurs every day, and while there might be minor points of differentiation between some of the other new carriers, in largest part they all continue to copy each other just the same way that the ‘original’ ten did. Perhaps a better measure is to say that in 1975, ten airlines sharing a similar operational approach had a 92% market share, and in 2013, that same market share is now held by only six, again generally more similar than not, airlines. And that sure doesn’t sound like a competitive improvement at all. Third, the barriers to future entry by new airlines are getting steeper and steeper and this is evidenced by the lack of successful airline startups (and the great paucity of any startups at all over the last decade). The latest new airline of any substance, Virgin America, started operations in mid 2007. It is still struggling with ongoing losses and a negligible 1.2% market share now, some 5.5 years later. The only airline ‘success story’ of the last 20 years is Jetblue; founded in 1999 and now with a 4% market share. Although a ‘success’, Jetblue is tiny. It is only one sixth the size of each of the three giants, and one third the size of Southwest. While it is unclear how much ‘blame’ should be attributed to bad management compared to uncompetitive practices in terms of other failed airline startups, the simple fact is that the airline giants now have a well established formula for responding to (and destroying) new airline startups. They’ll drop their fares on routes served by the new airline to levels at which it is impossible to make a profit, they’ll add extra flights at the same flight times as the competition, and they’ll massively increase their frequent flier benefits on those routes. The new airline startup is bled dry in double quick time, while the major competitor(s) with 25% market shares apiece never even feel the pinprick of pain caused by losing a little money on a very few routes. Not just by any, but by all measures, the latest round of airline mergers, resulting in now only three mega-carriers is not a good thing. Depending on how you interpret the marketplace economic data, we are at a point where the market is either strongly oligopolistic or tending monopolistic. This is not just abstract theory. It is being reflected in the steadily increasing airfares we are being forced to pay when we fly. See our airline ticket price in constant dollars chart slightly down the page which opens from the link and notice how the steady drop in ticket prices ever since deregulation halted about ten years ago and now is starting to appreciably increase. 1. All data has been sourced from the Bureau of Transportation Statistics service at the US DoT. Our thanks to them for their invaluable assistance. We also asked the US airline lobbying group, Airlines for America, for access to their data which goes back much further than 1974 (the start of the BTS time series), but they refused to even acknowledge us or answer our request. Do you think they are embarrassed at what their data might reveal? 2. We have adjusted the data to include mileage flown by contractor airlines on behalf of the major carriers they are contracted to provide services to, and in cases where there are subsidiaries of one carrier (eg Alaska and Horizon, or American and American Eagle) we have included the subsidiary traffic in their principal’s numbers. 3. We ignored non-scheduled (ie charter) service in this analysis, concentrating on the shifts in scheduled air service only. 4. At the time of this analysis, BTS had only published ten months of data for 2012. So the 2012 data is based on ten months not twelve months, but because we are showing market shares rather than total miles flown, we feel this is acceptably accurate. 5. We extended the 2012 data identically into 2013, other than merging the US and AA data, to show the effects more clearly of the pending merger. This data does not comport with any other statistics I have seen. 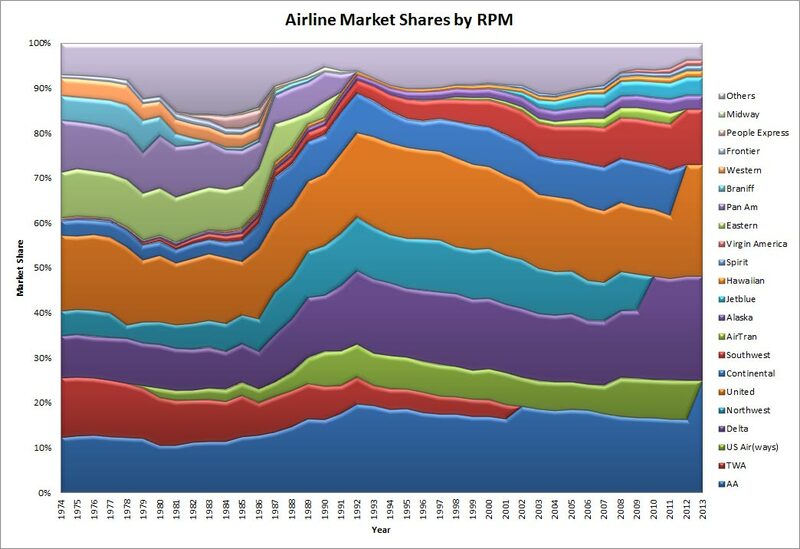 At no point in history did the top 5 airlines possess close to 90% domestic market share by RPMs. The BTS data does not reflect this nor do major news sources. Can you please provide more detail about where you’ve garnered these numbers? I think the answer to your question probably can be found in my second note explaining the data used. Weekly Roundup Friday 1 March 2013 Someone Stick a (Pitch)Fork in the 787 : Is It Done?